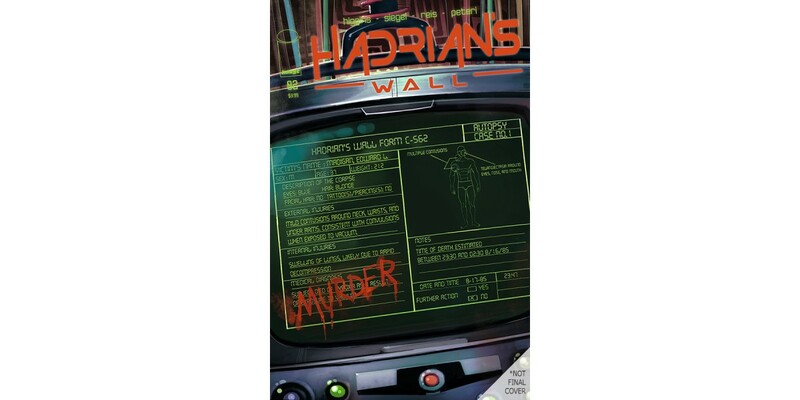 Image Comics is pleased to announce that issue #2 of the genre-bending sci-fi noir series HADRIAN’S WALL by C.O.W.L. super-team Kyle Higgins, Alec Siegel, and Rod Reis will be rushed back to print in order to keep up with customer demand. It will be available on shelves the same day as forthcoming HADRIAN’S WALL #3, providing customers with the perfect jumping-on point to the hot new series. When an astronaut on HADRIAN’S WALL is murdered, pill-popping detective Simon Moore is dispatched to investigate the ship’s crew… including his own ex-wife. But if Simon's not careful, what he finds could make the interstellar Cold War go red hot. In HADRIAN’S WALL #2, Simon must break the crew’s silence. HADRIAN’S WALL #2, 2nd printing (Diamond Code SEP168284) and HADRIAN’S WALL #3 (Diamond Code SEP160729) will be available on Wednesday, November 16th. The final order cutoff for retailers is Monday, October 24th. “This is how you write a film noir in space. The slow drip of information, past dalliances between characters, substance abuse, a femme fatale who may or may not be involved in a death, and over all of it, a seemingly faceless and unstoppable force of colonization feels like an old Chandler novel set in L.A.” —AiPT!